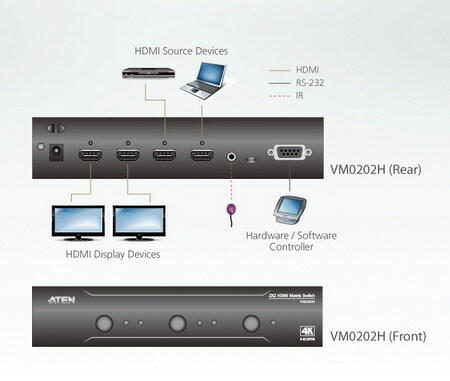 The VM0202H is a 2 X 2 HDMI Matrix Switch that meets HDMI Specification features including 3D, Deep Color up to 12- bit, and data rates up to 10.2 Gbps. Engineered for the future trend of high-definition video switching, the VM0202H supports computer and video signals at resolutions up to 4K. 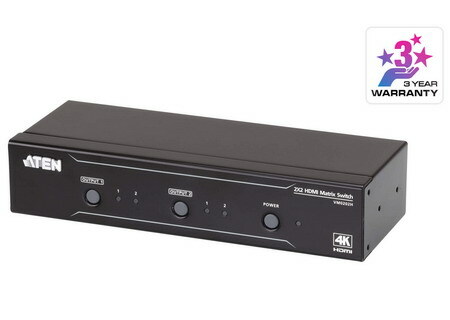 The VM0202H matrix switch provides high performance routing of 2 HDMI video sources such as HD camcorders, satellite boxes, HD-DVD players, high-definition Blue- ray players, home theater PCs and stand-alone streaming media players to any 2 HDMI displays. The remote control and convenient front panel pushbuttons allow you to efficiently cycle through HDMI source devices and displays, while the front panel LEDs indicate the source device for each display at a glance.